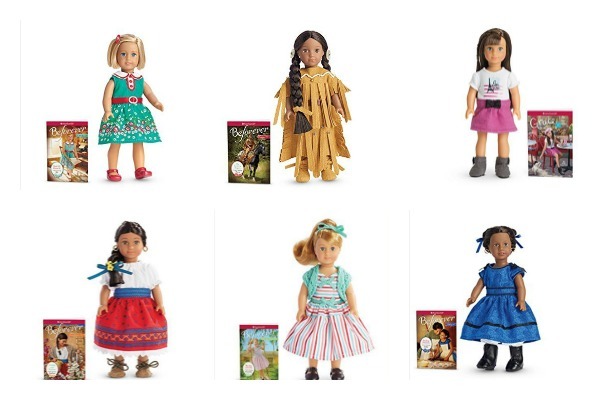 Amazon is currently offering $5 off a $15 Amazon book purchase with the code BOOKGIFT17, and it can be used on the popular American Girl Mini Doll & Book Sets! These six-inch versions of the popular full-size dolls come with a miniature abridged version of a book in the doll’s series. Simply add one doll to your cart that is $15 or more and use coupon code BOOKGIFT17 at checkout. You’ll end up paying about $10 for a doll/book set. This coupon code is valid through December 15 at mightnight EST, so act soon. If the doll you want is temporarily out of stock, you can still order it with the coupon code. If a doll is less than $15, just order two or add a doll and something else to your cart. For instance, the Felicity mini doll and book set is just $7.44. Of course, you could also add one doll + a different book if you wanted to your cart. Your total just needs to be at least $15 to use the coupon. See all dolls and order now. If you are interested in other doll/book sets that also work with the coupon, I found the below. Some will you need to add an additional book to hit $15. Amazon has lots of $2-$3 board books that are a good option. Disclosure: affiliate links used in this post. Thank you for supporting this site.